Home / Parking Matters Blog / You Talkin’ to Me? Here’s an interesting statistic regarding the primary cause of conflict: 10 percent of conflicts are due to differences of opinion. 90 percent are due to using the wrong tone of voice. Now, I can’t verify this statistic but I can tell you that it feels true. Like the adage, “It’s not what you say, it’s how you say it,” the tone of our voice can sometimes deliver a completely different message than what we intend. We inadvertently communicate an attitude of disinterest or even aggression through facial expression, body language, and tone of voice. Let’s be honest with ourselves: It isn’t always unintended when we choose to communicate this way. You know the parental tone I’m talking about. If you’re like me, at some point in the past, you’ve made a point to school someone who challenged your authority, viewpoint, or policy. Let me ask you—how’s that workin’ for ya? If our intent is to set someone straight when they disagree with us by adding a lecturing tone to what should be a professional message, it’s likely that the only point you’re getting across is that you’re not a very good representative of your agency or yourself for that matter. 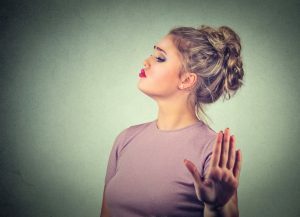 We are more easily understood when we leave the condescending attitude and tone behind and simply choose to communicate with respect—even when the person we’re speaking with doesn’t show us that same level of respect. This approach is especially important when the person we’re talking with doesn’t appreciate the message itself. Do yourself a favor by going out of your way to make sure your tone of voice doesn’t sabotage your good message.